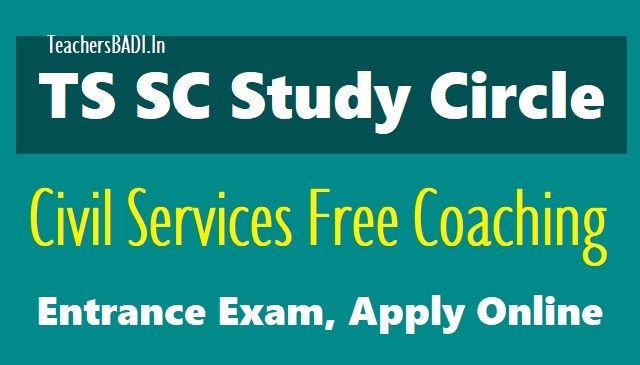 TS SC Study Circle Civil Services Free Coaching Entrance Exam 2018, Apply Online: TS SC Study Circle Civils Free Coaching Online Application Form 2018, How to Apply Online?. The Telangana State Scheduled Castes Study Circle, Hyderabad, which is working under the control of department of Scheduled Castes Development Dept., is going to organize free coaching for UPSC CSAT-2019 during the academic year 2018-19 for (250) candidates of SC, ST & BC communities, of which, (200) are for freshers and (50) repeaters. Online applications are invited from eligible SC, ST, BC candidates belonging to Telangana 31 districts for admission into Civil Services Aptitude Test of UPSC (CSAT-2019) free coaching programme at T.S. Study Circle, Hyderabad for the academic year 2018-2019. 1. Any Graduation of minimum three years course like B.A. I B.Com. I B.Sc. etc. 2. The annual income of the parent I guardian / family should not be more than Rs.3.00 lakhs per annum for SCs & STs and Rs.2.00 lakhs for BCs per annum. 3. Aspirants should not be employed or pursuing any other courses in any educational institutions during 2018-19. 4. Aspirants should not have availed any similar Civils coaching sponsored by Government elsewhere. 5. Aspirants should also be eligible as per the norms prescribed by the UPSC for appearing the CSAT-2019 Exam. Last date for submission of Applications 23-05-2018. Selection of candidates is through the entrance test only which will be conducted in two levels viz. Preliminary and Mains. So, Admission is through entrance examination as per the General Studies syllabus of the Civil Services Prelims Exam which will be in English medium only. Candidates will be selected for Main examination on merit basis, separately for men and women at the rate of 1 : 3 i.e. overall 750 candidates will be selected following the rule of reservation of both Men and Women, and only these 750 candidates will be allowed to appear for the Main examination conducted by the TS Study Circle, Hyderabad, to select 250 candidates for admission. The Mains examination will be conducted at Hyderabad district only. TA & DA @ Rs.500/- to each candidate will be paid only to those who appear for the Mains examination at Hyderabad district. Level 1 Preliminary Exam: The pattern of question paper for Preliminary entrance test is of objective type with 100 questions consisting of General Studies, English, Quantitative Aptitude and logical reasoning, where, 60 questions cover General Studies and 40 questions cover English, Quantitative Aptitude and Logical reasoning. The question paper for Preliminary examination will be in English only. Each question carries 2 positive marks for correct answer and 1/3rd negative marks for each wrong answer and thus the total question paper is for 200 marks with two hours duration. 1. The Main exam for a total of 200 marks may be conducted with questions for descriptive answers. 3. The above sections may cover Current Affairs, History, Geography, Polity and Governance. Science and Technology, Environment and Ecology, and International Relations. 4. The question paper will be both in English and Telugu. 5. The duration of Main examination is 2 1/2 hours (150 minutes). The date of Entrance test will be on 10.06.2018, and venue of the entrance test will be mentioned in the hallticket which will be uploaded in the website one week before the entrance test. Entrance test for Prelims will be conducted on 10th June, 2018 at Hyderabad, Warangal, Nizamabad, Karimnagar and Khammam districts. The rule of reservation followed is 75% - SCs, 10% - STs and 15% - BCs, and among total seats 331/3rd percent of seats to women candidates and 3% to Physically challenged persons shall be reserved. The 50 seats of repeaters are reserved for three categories of candidates. 3) Those who have cleared Prelims but studied outside T. S. Study Circle. However, the administration may review the criteria for considering admission of these 50 seats after the entrance examination. 3. Copy of Latest Income Certificate for the financial year 2017-18 issued by MRO which is in force. 5. Consolidated Marks memos of Degree. 6. Bonafide Certificates of Class IVth to Class X. 8. Copy of Aadhar card.